Are you looking for a wonderful place to get married? The Shoreline Benefice has four beautiful country churches where you can make you marriage vows. If you do not live in one of our villages, you can still get married here if you can demonstrate a connection with one of our churches. The rector can tell you more about this and about what we can do if you do not have a connection. If you want to get married in church, it is part of our duty of care to explain the vows you intend to make to each other before God and to prepare you for your married life together. We do therefore ask that you attend the yearly deanery wedding preparation day. This day gives you lots of information about the service and the choices you have, as well as about important aspects of married life. Couples who attended this year told us: “All of the sessions were very helpful and help us plan the rest of our special day. Thank you very much.” and “Uncertain about attending, but glad we did!” The next preparation day is on Saturday 3rd February 2018. Please be in touch though if you want to get married before that date! This year a wedding in the Shoreline Benefice costs £465.00 plus local fees. The local fees depend mainly on the choices you make (e.g. an organist, bells etc). 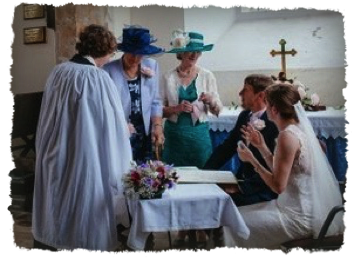 If you are thinking about getting married in the Shoreline Benefice, your first step is to contact the rector to find out what is possible. We can do a lot to make your day special, but to avoid disappointments, please be in touch well in advance and certainly before choosing a date or making any other arrangements. It is a great pleasure to organise a service of thanksgiving for married couples who would like to celebrate their special anniversary in church. This service often includes a renewal of vows and a blessing. If your anniversary is approaching and you would like to know more, please contact the rector.